If you are willing to part with 9,000 GBP (about 15,000 USD or 10,800 EUR), the Espresso Veloce Serie Titanio V12 coffee machine could be the most interesting item in your kitchen. 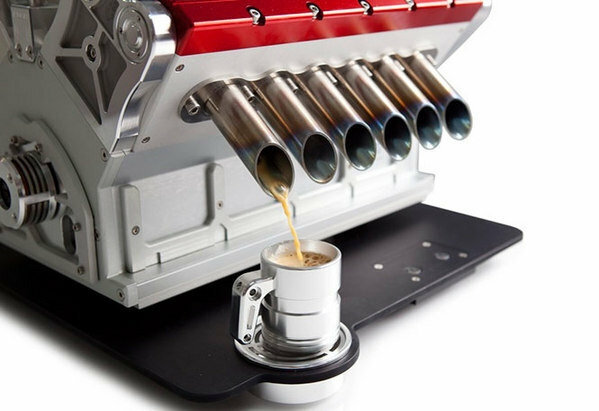 The price tag sounds a bit exaggerated for a coffee machine but it should be noted the Espresso Veloce Serie Titanio V12 is assembled from more than 90 precision components machined from sold billets. It has to conform to tolerances within a tenth of a millimeter and is manufactured from materials such as titanium, stainless steel and aluminum. The design is inspired by a Formula 1 engine and only 500 units will be produced. The Espresso Veloce Serie Titanio coffee machine is also offered in V8 and V10 versions. Their aviation-spec titanium exhaust pipes have to stay 18 hours in a zirconium ball-polisher in order to obtain a mirror finish, while the tips have to be blued with heat to imitate the discoloration seen on racing exhausts. A tribute to the grand prix engines of the nineties, the espresso veloce is the ultimate in functional automotive art. Tool room engineered using alloys such as magnesium, titanium and aluminium as used in engines raced by the likes of senna and schumacher, these iconic half-scale, 3-litre grand prix “motors” come in v10 and v12 configurations and are limited to just 500 numbered units worldwide. Not only does the “motor” produce a rich italian-style coffee, thanks to an oil-filler that doubles as a grappa reservoir the espresso veloce also creates the ultimate caffe corretto ! Conceived and hand-built by arte meccanica, the espresso veloce is the last word in coffee engineering.